Please take a moment to admire my beautiful Dreamcatcher. I finally found a Dream Catcher that was large enough to win my heart & take pride of place in my bedroom. I bought this beautiful piece from Whitby at the weekend & I haven’t stopped admiring it since! I am so sorry I haven’t been posting much lately, been super busy at work. I also seem to have what I am going to call ‘bloggers block’ I just can’t seem to get my blogging mojo back at the moment. I am hoping that pretty soon I will get back into the swing of things & be updating regularly again! Has any one else ever suffered this problem? Previous Post A Girl Can Never Have Too Much Vintage…. 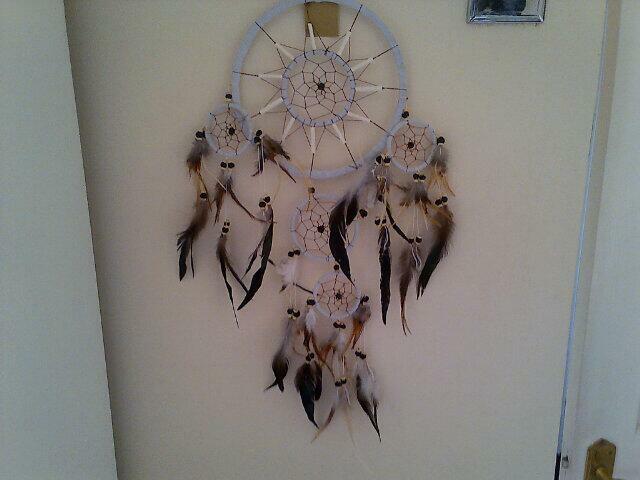 I have always loved the idea of the dream catcher. Your’s is gorgeous! I love it! Really it’s 4 dream catchers in one!